A diagnosis like leukaemia has a tremendous impact on any family, but for an adolescent to receive the news it can be all the more complicated. This is what happened to Lorena when she was 14 years old. It started as a normal summer and she was playing tennis daily. She felt tired but she didn't want to tell her parents because they would tell her that it was because she ate very little. Slowly Lorena began to lose weight and became tired more frequently. "I would climb up the stairs and it would feel like I had run a marathon", she explains. "In addition, I would have abnormally rapid heart beats". This accelerated heartbeat triggered the alarm bells. One summer night, Lorena was eating dinner with her family and she noticed an abnormally rapid heart beat. Her older brother, who was studying Pharmacy at the time, took her pulse. They were concerned so they decided to take her to the doctor the following day. At first, because she was so pale, the doctor thought she was anaemic, but the results of the blood test revealed a rather different fate. Lorena's family were expecting to wait 15 days for the results of the tests but the same afternoon they were told that she would have to be hospitalized immediately. After a spinal tap, there were no doubts about the diagnosis: "Acute Lymphoblastic Leukaemia". Lorena remembers that neither the doctors nor her parents hid anything from her. "They told me directly that it was cancer, and that it was a fatal disease" She explains that "it was all like a film, I wasn't very shocked until they told me that the treatment would cause my hair to fall out. That destroyed me completely". This reaction from a girl of 14 years old to such news can be a little chaotic. At the time, Lorena's plan was to not fall behind in her school work or to lose her friends. "I remember that a girl my age who had had leukaemia came to talk to me in the hospital. She told me that in this situation I would recognise who my real friends were. With this in mind, I decided not to tell anyone. I didn't want any last minute surprises", recalls Lorena. Her decision could not be carried out in the end because she told her friends and it all went smoothly. "After I thought that I had to be thankful that the leukaemia had been discovered in the summer. I could take the course of treatment more or less normally but I was constantly thinking, why me? Why have I been affected? What have I done to deserve this? But then I looked around and saw babies of only 3 months old who were in the same position and I thought that they deserved this even less than me!!! - explains Lorena. After everything, in those hard months in the hospital, Lorena not only discovered bad things, she also found her vocation: to take care of the sick. Nowadays, she is 26 years old, and she is a nurse in the same hospital where she got over leukaemia, Sant Joan de Déu Hospital in Barcelona. 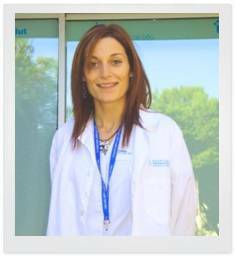 "I find it funny to meet Dr. Estella in the corridors...He and Dr. Ribes were the ones who cured me... and now they are my work colleagues!" she explained happily. Lorena was sure when she began working at the hospital that: "if possible, I did not want to be in the oncology ward. Not because of the patients, but I would see the mothers of the children and remember how my mother suffered. I was short-tempered and in bad shape and she stayed to sleep with me, getting up at 5 o'clock in the morning to go to work", she comments emotionally. When asked about plans for the future she is clear: "to continue having a stable job, to start a family, to enjoy my family, my boyfriend and my nephews". We asked her what she thought she would say to a patient who was going through the same as she went through. She reflected and told us: "to have motivation to see the future, that leukaemia is a pothole, a bad period, but that sooner or later it will pass and that they should face up to the situation in the most positive way possible. Also to appreciate those who are by our side". And it won't be easy since cancer is a very tough disease for a child, but children are the strongest of all. She makes a comparison that we love: "Children with leukaemia are like ants, they have the capacity to support 50 times their own weight".